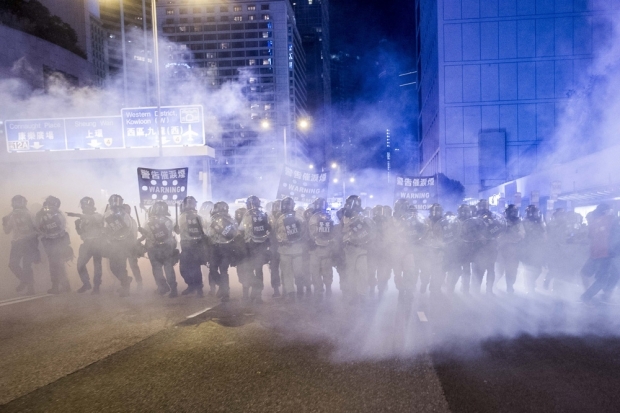 Police officers stand in a cloud of tear gas during a demonstration in Hong Kong on September 28, 2014. Police fired tear gas as tens of thousands of pro-democracy demonstrators brought parts of central Hong Kong to a standstill in a dramatic escalation of protests that have gripped the semi-autonomous Chinese city for days. It marked a dramatic escalation of protests in the city, which rarely sees such violence, after a tense week of largely contained student-led demonstrations exploded into mass angry street protests. Hong Kong’s massive protests should have surprised no one. A bitter debate over political reform split the city. Beijing’s high-handed diktats deepened the anger. Before the protests, the question was whether or not the vast majority of this city of 7 million who favor a more rapid adoption of democracy would be cowed in the face of Beijing’s authority. The presence of tens of thousands of people on the street on September 28 has provided a decisive answer. Hong Kongers know the risks of angering Beijing. But they are impatient for change. Partly, this reflects the energy of a new generation. The leader of the students is 17-year-old Joshua Wong, who was less than a year old when Britain surrendered sovereignty of its Crown Colony to China in 1997. But the students have been joined by people of all ages, including some in their ’80s and ’90s who fled Mao’s communist revolution. Student protestors stormed the gates of the government complex in downtown Hong Kong on Friday night and Wong was among those arrested. Two nights later, impatient police had used tear gas, in what seems in retrospect to have been a major error. The unusual use of tear gas on Sunday, September 28 marked an important date—the date that China’s heavy-handed policing methods truly arrived in Hong Kong. The tear gas has not ended the protests and may in fact have galvanized protestors. In these waning days of September, as Hong Kong and China prepare for the National Day holiday and the 65th anniversary of the People’s Republic, a new set of questions emerge. Some are tactical: Can the protestors keep up the momentum? How far will the police take their new, more forceful approach? But the over-riding questions are existential: How will China’s Xi Jinping, who previously was in charge of the Hong Kong portfolio, respond to this frontal challenge to Beijing’s authority? Will he give Hong Kong’s embattled Chief Executive C.Y. Leung any room to maneuver? Instructions handed down from the National People’s Congress in Beijing on August 31 pushed back electoral reform and were seen by many as a sign to tremble and obey, to kowtow to the orders of the sovereign power. At first, the tough message seemed to be effective. In a city that fears chaos, the call for obedience resonated. The Occupy Central movement appeared to be backing down. But the surprising strength of student protests last week changed the dynamic in what is a volatile, unpredictable situation. The police were caught off guard and ended up taking a series of actions—including arresting a number of leaders–—that led to fractured protests throughout the city, among the most violent in Hong Kong since the 1967 Cultural Revolution. There have been calls for protestors to leave the streets and turn down the heat. But the city is like a house with a broken thermostat. A fractured protest movement, a government that does not—or is not allowed to—engage in serious dialogue, and a generation that has grown tired of promises that it will have to keep waiting for democracy makes for a society that cannot easily be calibrated. Beijing has no good choices. The resignation of Chief Executive C.Y. Leung, one of the protestors’ many demands, is no longer unthinkable; the Special Administrative Region’s first Chief Executive, shipping tycoon Tung Chee-hwa, stepped down in 2004 after massive protests. But Leung’s resignation would not solve the governance problem that entombs Hong Kong, that of a wealthy, well-educated city without an accountable government. If Beijing acts true to form, and in line with what we have seen to date from Xi Jinping, sustained protests could see Beijing order the Hong Kong government to end the protests, whatever that takes. On Sunday night, the government was forced to put out a statement denying that PLA troops, who are stationed in the city, were moving tanks in for action.